DAILY THOMPSON is a German three-piece that was founded in 2013. They mix their personal influences from early Grunge, Garage and Indierock to a massive overridden, extremly fudgy Superfuzz-Bigmuff! 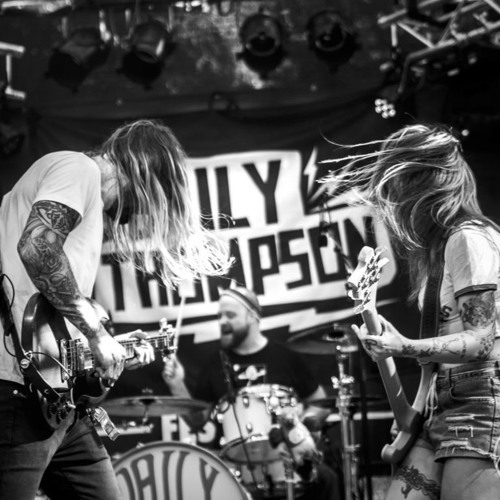 Inspired by Fuzz Rock at its best they have crafted a gigantic sound that combines Noise, Indie-Blues and even Stoner-Rock with the usual Fuzz-, WahWah- and distortion attacks Daily Thompson stands for. Last year the band also performed at the famous German TV WDR Rockpalast Crossroads Festival, Daily Thompson played more than 50 shows in 2017 and shared club- and festival stages all over Europe with bands like, Dinosaur Jr, Kadavar, Mustasch, Turbostaat, Greenleaf, Truckfighters, Lucifer, Karma To Burn etc. 2014 the band released their debut LP and in 2015 a split 7” with US band Mos Generator and hit the road again - smashing their grungy fuzzy tunes at festivals and clubshows. 2016 the band released their second longplayer “Boring Nation” and the split 7” release “River Haze” was celebrated at the Reeperbahnfestival 2017! 2018 the band recorded their 3rd LP with a bunch of raw new material!